Google is expected to unveil Android 4.4 KitKat by the end of the month, and leaked bits and pieces of the highly-anticipated OS update continue to slowly trickle in. 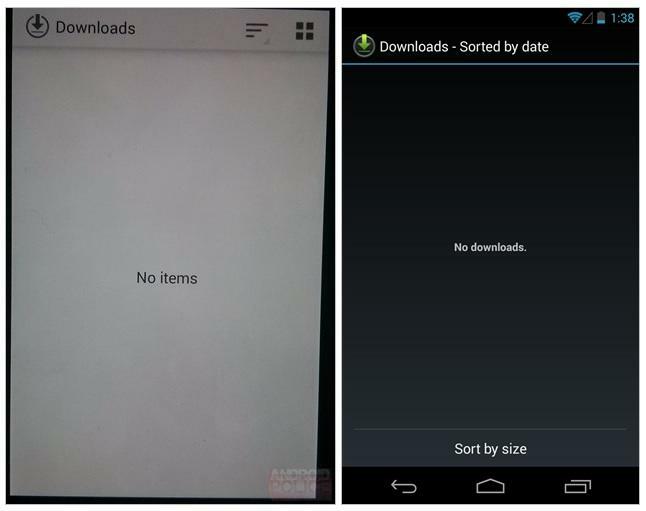 Today’s screenshot, courtesy of Android Police, shows a redesigned version of the software’s Downloads user interface. Normally this wouldn’t be a big deal, but it looks like Google has made some big changes to the UI, hinting at a possible sweeping redesign. The biggest change is the switch from the increasingly-stale Holo Dark background to Holo Light. The shift from black to white helps update Downloads to match Google’s changing image across all its platforms, putting an emphasis on the clean and friendly design we’re seeing everywhere from its mobile apps to browser-based services. Android 4.4 also adds two new buttons at the top right of Downloads: a grid icon, which will likely reorganize the way you view new downloads, and three horizontal lines, which probably let the users sort downloads by size or date. Android Police founder and chief editor Artem Russakovskii claims he received the leaked screenshot from an anonymous tipster, but gives it a 90 percent chance of being accurate. However, we won’t know anything for sure until Google makes an official announcement on Android 4.4 KitKat, and with the unveiling looking like it will take place near the end of October, we probably won’t have to wait long at this point.